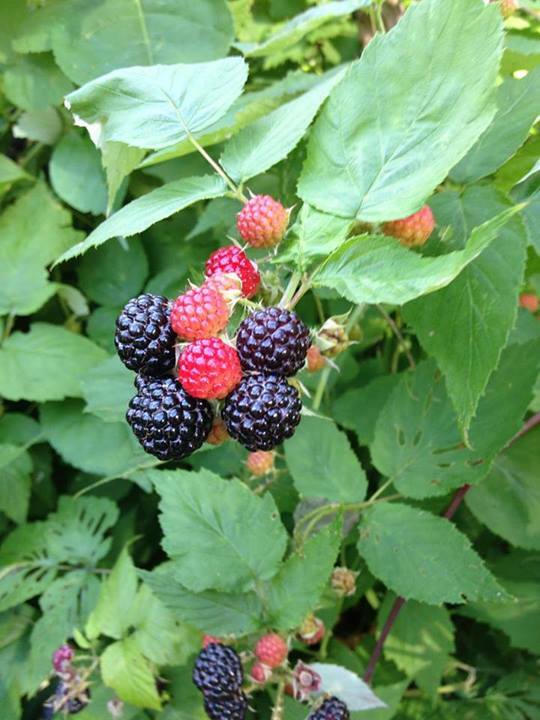 Every year, I look forward to the black raspberries that grow all throughout the fields and wild places where I live. These black raspberries are incredibly flavorful with with crunchy seeds. They have never been commercialized, meaning no company has grown them for profit. You cannot buy them in the store. You can only wait for late June and watch them ripen and invest the energy in picking. Each year, the black raspberries and so many other fruits, nuts, and wild foods are a gift from the land, the land that offers such abundance. If I would purchase such berries in a store, my relationship with those berries would be fairly instrumental–I pay for them, they become part of a transaction, and then I eat them. There is no heart in such a transaction. But because these berries can’t be bought or sold, when I pick them, the land is offering me the gift of sustenance. Gifting is a much different kind of relationship, a powerful and connected relationship, a relationship that asks not only for reciprocation but gratitude. Gratitude is an incredibly important aspect of reconnecting and reciprocating with the living earth. Given the recent cultural holiday of giving of thanks, I wanted to reflect on the idea of gratitude practices and share ideas for what we could do in the druid tradition to offer gratitude to the living earth and her many aspects. So in today’s post, we’ll explore how to develop a gratitude practice and why it matters. What is a gratitude practice? There are lots of words you might use to describe a gratitude practice: honoring, venerating, giving thanks, respecting, and so forth. What I’m calling a “gratitude practice” puts us in regular contact with the living earth and allows us to express our respect, gratitude, and offer our thanks to the living earth and various aspects of nature. Nature provides everything for us–even if we are mostly disconnected in the western world from that process. Re-imagining our relationship as one full of gratitude helps us reconnect to the living earth in incredibly powerful ways. There are many, many ways to engage in gratitude practices–speaking them, writing them, saying them. One common gratitude practice is ancestor work, which I wrote more about in an earlier post, and where we are in gratitude towards those who came before. 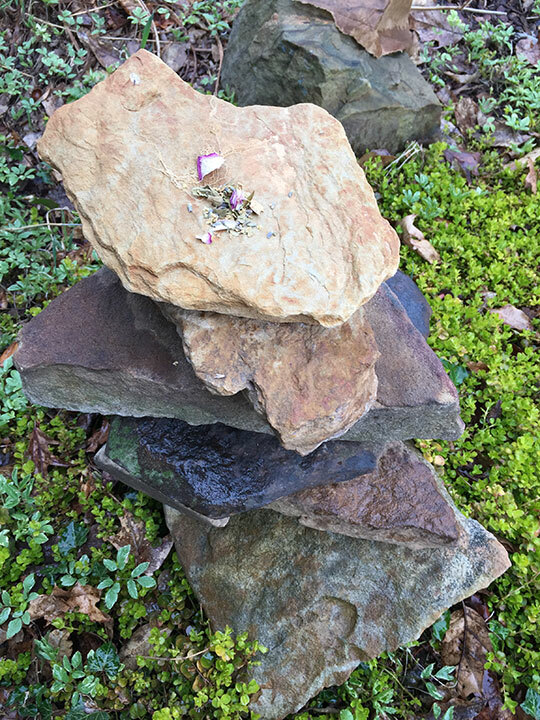 Today, I’ll explore a long-term strategy for gratitude practices surrounding the living earth–through choosing aspects of nature to honor, creating shrines, and making offerings. The word “honor” refers to treating someone or something with admiration, respect, and recognition. If we think about the way we honor humans–soldiers, guests, or dignitaries–we may offer gifts, set aside special spaces for them (statuary, memorials, etc), or hold various kinds of celebrations for them. For example, in American culture we have presidential monuments, days honoring Martin Luther king and others of importance, monuments to fallen soldiers, and we offer regular respect to those humans who have done something extraordinary. If we use this same kind of thinking to honor nature and aspects of nature, we can develop a deeper relationship to nature over time and make this a core of a gratitude practice. Some druids may choose to honor all of nature or focus on “the land” or “the earth” as the center of a nature honoring practice, while other druids may choose to focus and work with a specific aspect of nature intensively. Working to honor that aspect of nature—say, an element manifested in the world, an animal, a tree or plant, a mountain, a river, a natural phenomenon (storms), etc, can put you in a very deep relationship with that particular aspect. Thus, choosing who or what to honor in the natural world is important and is highly individual. Some druids may have already been drawn to a particular animal, plant, place, or other aspect of nature, while others may need to seek out different aspects to honor. Perhaps you have a plant species you have always been drawn to, or perhaps an animal species frequently visits you. Perhaps you’ve had powerful experiences in a particular place, or along a particular mountain ridge. Perhaps you feel energized and excited by the storm. You can select one, or multiple aspects of nature, to honor. As you choose to work with nature or aspects of nature, recognize that gratitude is work of the heart. The most important choice, then, deals with your own personal connection to the living earth and her spirits. What aspect of nature is deeply meaningful to one person may not be to another—the point of all of this is to develop, for yourself, deep relationships. Follow your heart and intuition. In this section’s activity, a specific ritual is given that can help you choose which aspects of nature you want to develop a devotional practice towards. In an animistic perspective, we recognize the difference between matter and spirit, and in this case, both can be honored. For example, one druid decided to honor the black bear, so she begins by bringing in black bear imagery and statuary into her home; learning about the black bear; and creates a small shrine in the woods near her home to honor the greater spirit of the bear. She also learns about a local movement to protect bear populations and volunteers her time. In doing these kinds of honoring activities, she is able to deeply connect with the bear energies and bring those energies into their life. In a second example, a druid chooses to honor the local mountain range where he was born and raised. He learns about this mountain range, its history, and what lives there and grows there; he spends time hiking and backpacking on various parts of the mountain range; and he does regular ritual to protect the mountain from harm. He also carries a piece of wood in his pocket from the mountain and places a second piece of wood on his home altar. He connects to the spirit of the mountain through deep meditation and journeying work. One way of engaging in a gratitude practice is through creating a shrine or special space inside or outside of your home to honor the living earth and/or specific aspects of nature. In the druid tradition, a “shrine” is typically dedicated to a specific aspect of nature, while an “altar” is typically more of a working tool where you might engage in various kinds of rituals and practices. “Sacred spaces” are larger areas, perhaps containing a shrine or altar, that are dedicated to sacred activity. However, these can blend together, and we druids don’t get too picky about the differences. To create a nature shrine, you need to consider four aspects: where the shrine will be, how you will construct the shrine, what the goal of the shrine is, and how often you will interact with the shrine. There is no right or wrong way to answer these questions–but you should give them some thought. Honoring the Fallen Shrine (Outdoor). The “honoring the fallen” shrine was a large shrine on a recently cut stump. The shrine consisted of sticks, stones, and bones, with a stack of stones in the middle. The sticks, stones, and bones came from sites that were damaged or hurting. The shrine honored trees, animals, and others who were passing on due to human interference. I would honor species going extinct, trees and forests that were cut, making regular weekly offerings at the shrine. Protecting Waters Shrine (Indoor). The “waters” shrine was to honor the waters of all kinds: rain, lakes, rivers, streams, springs, and so on. I gathered water offerings from all over the world (and asked friends to bring me water from various places) and I would put the new waters in little glass vials with a label. The shrine held the glass vials. This shrine had a beautiful large bowl of water as the centerpiece, which I kept regularly filled. This shrine was near a large tub I had in my bathroom, up on a little ledge. Poison Ivy Shrine (Outdoor). Everywhere I’ve lived, poison ivy has lived with me, and I’m one of the very sensitive people who get it easily. The poison ivy shrine was created to honor the poison ivy on the property and ask it not to harm me or my guests. 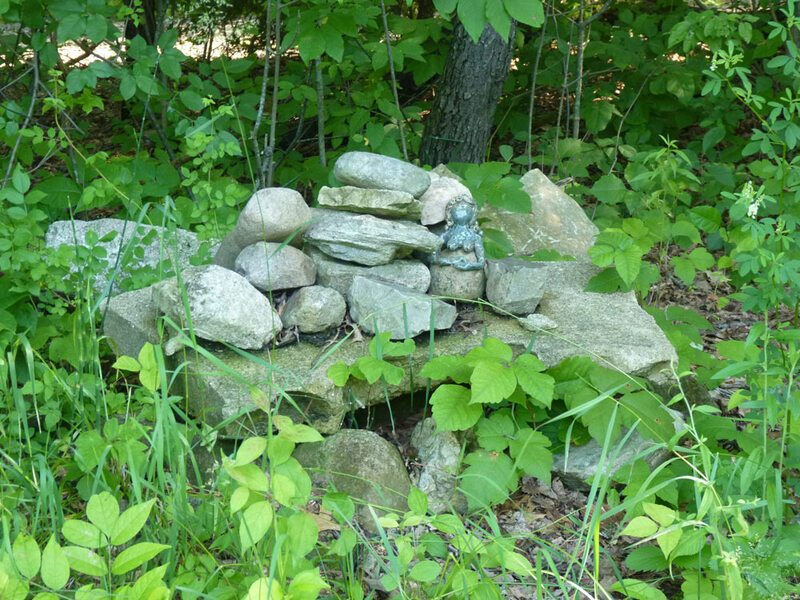 I built this shrine in the winter when the poison ivy was more dormant after scoping out a place with the most poison ivy on the property. I created a small shelf with several rocks and then created a clay statue that was my personification of poison ivy. I put the statue on the rock shelf. And then, I let this shrine alone. As the poison ivy grew back into the space, it mostly covered the stone and statue. I left this shrine largely be, as poison ivy wanted to be left alone! Land Healing Shrine (Outdoor, Group). I created a land healing shrine with a group of druids was a land healing shrine, also on a large stump. We took fallen wood from the property, cut it into wood rounds, and then woodburned protective and healing symbols and ogham onto the wood. We left these on the shrine along with aspects of the four elements. The goal of this shrine was to send healing out to the land. The Mother Earth Shrine (Outdoor). This shrine was created to honor the entirety of the land and all of her spirits. I would frequently gather new things for this shrine from wild places and add them to the shrine. Over time, the pile grew quite large! The shrine itself was wild—I never cleaned leaves off the shrine but rather let everything layer just like it does in nature. I left regular offerings of cornmeal here as part of my daily spiritual practices. The Animals Shrine (Indoor). I created a small shrine, using only photographs on a wall space, in my office. I wanted to honor certain animals in my local ecosystem and also draw upon aspects of those animals while at work. The cluster of photos didn’t appear to anyone as a sacred space, but I understood the intent of the work. One the things you might notice about the shrine examples I’ve offered above is that the shrines don’t just have a theme—the have an intention or goal. Your goals and intentions may evolve as you work deeply with the spirits of nature, so you can see these kinds of shrines as evolving things. I do think as you create a shrine, the shrine will evolve just as you evolve! Sourcing materials for your shrine is also a critical choice, and sends a particular kind of message to the land and her spirits. For outdoor spaces, it is a good idea to make sure anything that you leave will not cause harm or pollution to the land. Further, you want to make sure that the earth was not harmed in the creating of that thing or the taking of that thing. This means you might use more naturally-oriented things or representations: sticks, stones, collected objects, secondhand objects, handcrafted objects, and so on. You can make beautiful shrines, altars, and sacred spaces using materials only from the land around you in many cases. Using things directly from the land allows them to break down and return to the land gracefully. Spend time planning and building a shrine to nature or to a specific aspect of nature. The process shouldn’t be rushed—often, the process of building a shrine takes time and unfolds in unexpected ways! First, you want to source the right location. Whether indoors or outdoors, it takes time to find the right spot. If it is in the house, you want to think about where it might be, and how visitors and other family members may interact with it (or not), and may respect it, or not. I once created a beautiful shrine in a guest bedroom, which worked except when I had guests who didn’t understand it and didn’t respect it well. If it is outdoors, you again want to think about other people who may have access to the shrine and how public or private the shrine will be. I prefer to keep shrines as private as possible, unless I’m working with a group of fellow druids and we are co-constructing a shrine (as one example explored above). When sourcing a location, I recommend taking some time and doing multiple visits to ascertain the right location and if the spirits of the land would welcome the shrine. There are lots of considerations for location, particularly in terms of the weather, seasons, accessibility, visibility, and human interaction. Once you’ve selected your spot, now comes the fun part of building the shrine. I like to see a nature shrine as an evolving thing—just as the wheel of the year turns in nature, so too your shrine evolve as you find new things for it. Shrines do not have to be complex, even a small stack of stones or ring of sticks works beautifully for a shrine. The timing of initially setting up your shrine also can be important. Choose a day or time that is meaningful—a new or full moon, one of the druid holidays (solstices, equinoxes, cross quarter days) or some other day that lends itself well to the energies of your new endeavor. After you have your shrine built, you’ll want to think about how you might regularly tend it. Regular attention to the shrine assures that you are connecting deeply with the energies of the shrine and connecting with that aspect of nature and that you are investing time, energy, and care into the shrine. Regular tending may include clearing the shrine of debris, replacing objects, and so forth. It may also be quietly sitting with the shrine, meditating near it, and simply observing it during the various seasons (if outdoors). There are lots of ways you can regularly tend and visit your shrine. Another thing you can do regularly at your shrine is make offerings–this helps you “give back” and engage in a more reciprocal relationship with the living earth. 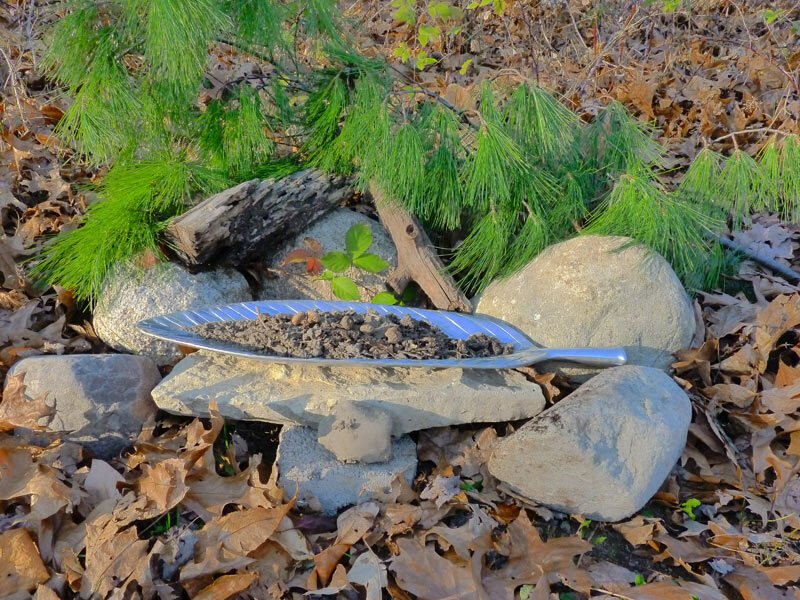 Offerings are often symbolic representations of our understanding of the give and take relationship we have with the earth that provides abundance. One of the ways you might think about offerings within a druid framework is that they are part of a larger gratitude practice. That is, through offerings, we are giving thanks, acknowledging, and honoring nature. In terms of what to offer, the general principle here that I like to follow is this: my offering should be an offering of something that I value and that is important to me, not simply an empty gesture of something that I purchased. These things may be physical or non-physical. On the side of physical things: many things that can be purchased are problematic because their purchase put additional strain on the land (the resources that produced it, the shipping and fossil fuels, the packaging that creates plastic waste, etc.). So you want to give any physical offerings some careful thought. One of the ways you might get around this is by either growing offerings, finding them, or wildcrafting them. A great offering could be something as simple as acorn caps gathered in the fall with a symbol painted on them in a natural ink. You could gather small stones or pieces of bark and bless them with the elements, and then use them as an offering. Another option is to create or grow a sacred offering blend of herbs (I use home-grown tobacco, lavender leaf, and rose petals as my current mix, see this post for more information). You can also purchase offerings that are sustainably created—go to a farmer’s market and buy a bottle of locally produced organic wine or locally milled cornmeal or flour, for example. Non-physical things make wonderful offerings as well. Bardic practices, like drumming, dancing, singing, and so forth can be a great offering of your time, energy and spirit. I will also note here that music in particular is a great offering if you want to honor the spirits of the land while others are around—I like to take my flute to majestic places (which often have other people visiting them) and play a song or two. The intention of the song is an offering to the land, but it doesn’t hurt to have others hear it too. I hope that this post was useful in thinking about one way–among many–that we might engage in a regular gratitude practice as part of our paths in honoring and connecting with our most sacred earth.